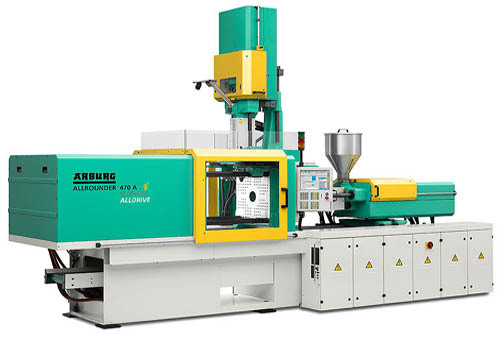 An electric Allrounder 470 A injection molding machine with 1,000kN clamping force and a size 290 injection unit will be producing magnifying glasses made of LSR in a cycle time of around 65s. The highly transparent material has a hardness of 70 Shore A. A four-cavity mold from Shin Etsu with cold runner technology and an ejector system is used. This positions the magnifying glasses, each of which weighs 8.4g, in the mold so that they can be gripped by a Multilift Select robotic system. The magnifying glasses are separated from the runner system in the gripper and placed on a conveyor belt. LSR processing requires special injection unit with liquid temperature control for reliable processing, said Arburg. This is because, unlike thermoplastics, LSR materials need a combination of a cold cylinder module (so that the reactive material mixture does not undergo premature cross-linking) and a hot mold. The company’s LSR solution includes a compression-free screw, needle-type shut-off nozzles and a purpose-designed non-return valve. Mold heaters, demolding devices and vacuum technology are also available. Meanwhile, a Freeformer will be used to produce functional parts on the basis of 3D CAD data. Plastec West will be held in Anaheim, California, the US from February 9-11, 2016.